How a 48250 INR ticket is resulting in a 3 lakh spending! I’ve had one brief visit to USA way back in 2012. Had spent 5 days in New Jersey and 2 days in New York. Since then, another trip to USA never materialized- mainly due to expensive ticket cost, partly due to time it takes to do a reasonable trip to USA- at least 2-3 weeks are required to reasonably explore key parts of US and getting so much leave is difficult for office goers. I was busy exploring South East Asia using Air Asia's cheap tickets. Having visited most of the countries that part of the world and with Air Asia not running deep discount sales of late like it used to earlier, I was keeping an eye on west. Earlier this year I had planned a trip to US on WOW Air,- Delhi to Los Angeles for just 27000 INR return but WOW Air stopped India flights, so my trip didn’t happen. Recently once it firmed up that I would be taking a break from my work, first thing that came to my mind was why not do this long pending US trip. Will be difficult to plan month long trip once I get back to another job. Also I had a US Visa that would expire in 2022. Will save some visa money if I travel before current visa expires. Thus I made up my mind to plan a trip to the USA. Cheapest flight but other things could get expensive/less flexible due to flight dates locked. Ideally I should have done a high level plan, an estimate of how much everything would cost and then begin my bookings. But I did everything opposite. I accidentally spotted a super cheap deal on Qatar Airways- 48250 INR return from Chennai to Washington and back. The trip was for some 34 days- purely because this was the only date combination I could find for which the price was cheapest. A few days earlier or a few days later, I had to pay more, so settled for this 34 day trip to the USA. This is indeed a good deal- given that Qatar is full service airline- food and baggage is included, flight is convenient (one stop via Doha). Normal return fare to USA is about 55-60k at best. More if you’re specific about dates. 48k was very tempting. I got a 24 hours hold on the fare, deliberated a bit and booked. This has been my approach all along- book the cheapest flight when I spot it and worry about everything else later. But usually I would have the advantage of time- my earlier tickets were booked several months to even few years in advance so I could plan rest of the things well. But this time it was different- travel date was less than a month away so I had to hurry and plan rest of the things once ticket is booked. Now the main India-US flight is sorted and I was committed to a 34 day trip. Next was what to do in these 34 days? Where to go in America? Besides visiting major cities in America, I also wanted to visit various countries in Central, South America that give free visa to Indians having USA Visa. It makes no economical sense to fly to these places directly from India, but as an extension of US trip, it is very viable. If I had my way, I would have visited every country possible, but then both time and cost constraints kicked in, despite me planning a 34 day trip. With only a month left, round trip ticket to most of these countries cost about 20k+ at the minimum and even at 2-3 days per country, I would need lots of time to explore all of them. Most of them are small island countries, with mostly beaches as major attraction. I decided it is enough to visit Bahamas, which would give fair representation of most of these tiny countries in central America. Thus decided to skip Dominican Republic, Jamaica, Sint Maarten and many such small island countries in central america. Having drafted a high level plan to visit Bahamas, Bogota, Panama and Costa Rica, I booked Washington DC-Nassau (Bahamas ticket) on Southwest. 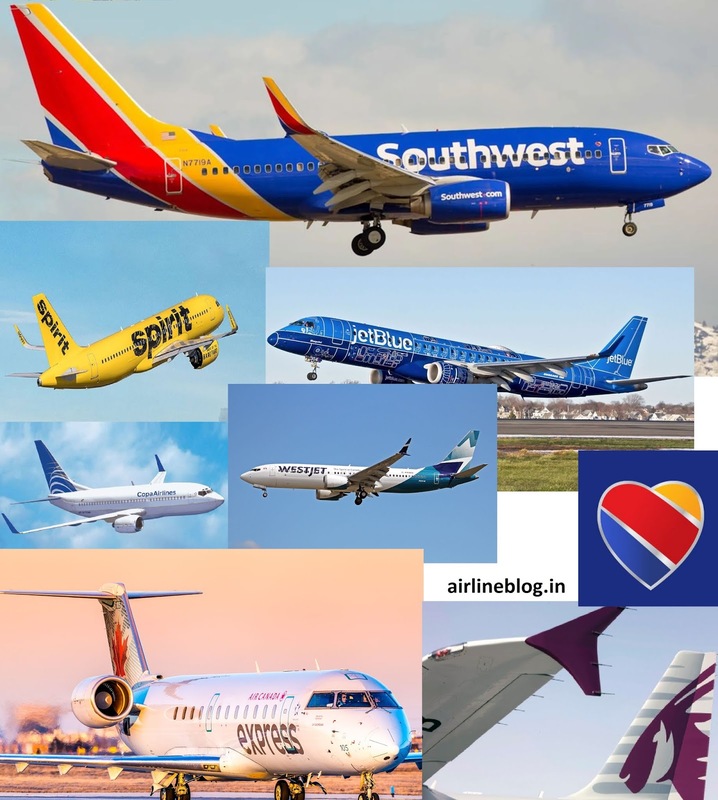 But realized that overnight prices have gone up a bit- thanks to the grounding of 737 Max. If I had booked a day before, I would have saved about 20k INR. If I had skipped Panama and Costa Rica I could have probably saved about 30K INR- but then, I wasn’t sure when I will ever be visiting these countries again- so gave in to the temptation and booked Bogota-Panama City, Panama city-Costa Rica and Costa Rica-Miami. Each of these flights cost me about 150-170 USD. No Peru: Peru was on my radar and seriously wanted to include- but then, flights to Lima were not cheap-at least around 20-25k INR return. Plus if I spend 7 days in Peru I will have much less time for everything else. No decided to keep Peru for another time. Even Mexico had to be missed due to time constraints. Booked Miami to Austin (where I had a relative), Austin to Las Vegas, Vegas to SFO, SFO to San Diego, LAX to Vancouver and Vancouver to Washington DC. California to Washington DC Via Canada! 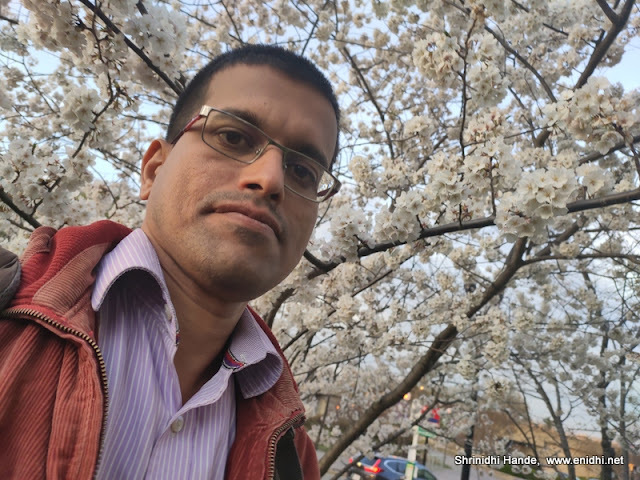 I had two options- Fly to SJC (San Jose) to Washington for about 6000 INR, or fly to Vancouver on Westjet for 77 Dollars and then reach Washington from there for about 11400 INR. Effectively for about 10000 INR more, I could visit Vancouver. Vancouver is too far from India, so bit expensive to visit. It is closer to LAX so would be convenient to cover in this trip. Toronto and Niagara falls will have to wait- but that can be visited later for less. I already had Canada visa- considering above factors, decided to extend to Vancouver as well in the trip. 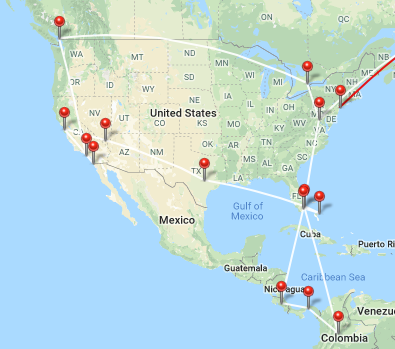 Overall booked about 12 flights to fly between Washington-Bahamas-Bogota-Panama City- Costa Rica, Austin, Las Vegas, SFO, SAN-LAX, Vancouver and back to Washington. This cost me close to 1 lakh rupees. Roughly 120 USD per flight. Lots of money but it would cover 6 countries and take care of most of my commute between cities. Some of the flights on South West were lot cheaper than Grayhound bus service. So it made perfect sense to fly. Now my expense has touched 1.5 lakhs (all flights only) and much more expense was yet to come-hotels and local transport and site seeing. I knew I will have to spend a few lakh rupees, but I could clearly see the expenses ballooning. May be I should have cut it a bit but it was too late. I had committed to fly and there's no looking back. Some of the flights were very early in the morning and public transport in those cities would begin too late- like about 5 AM only- so had to select a stay which is bit expensive but closer to airport, so that I can save on taxi expense or worst case walk a few kms to reach airport. Some cheap AirBnBs were for students only. Upon declaring that I am not a student, I was denied. Some stays in Las Vegas had crazy extras – like mandatory resort fee, cleaning fee etc which when added cost a lot per night. Next I had to factor for food. Assuming a moderate 25 USD per day, I was looking at a spend of 750 USD over 30 days. Most accommodations I booked were super cheap and didn’t include breakfast. Some of the days I would spend with friends/relatives but still may have to have lunch outside. 25 USD is a bit tight, but I hope to manage with hostel self-cooking where possible, manage with cheaper bread, fruits etc than full course meal and most flights have some snacks included (South West). I am hoping this budget will be adequate. I am carrying some pickles with me, which can supplement bread. Now my expense stands at some 2.3 lakhs INR. Next I have to worry about site seeing. I decided to focus mostly on free to visit spots and attractions, exclude expensive ones. Still I might need some 300-400 USD- half of it is factored for day trips from Bogota, if I can’t find cheap public transport options and had to book a tour. Hopefully I don’t have to spend all of that. I plan to skip super expensive options and look for economic alternatives. Other major expense left out is local transportation. My plan is to use public transportation as much as possible and avoid taxis. Still over 30 days I may need a few hundred dollars. Even at a moderate 200-250 dollars, my trip budget is now at 2.8 lakhs. Bought a travel insurance from Reliance for 1.6k INR. I already had a TSIM global sim card and USA visa, thus a few k expense saved. Then I will need some buffer cash, for any contingency. Factoring that, my trip expense now stands at 3 lakh rupees INR. 3 Lakhs is lot of money. But then in an overall scheme of things, it looks like a reasonable spend for the experience and coverage it offers. I am visiting a total of 6 countries over 34 days. Works out to 50k INR per country. Some INR 8300 per day. I’ve spent more than that- trip to Japan, NZ etc have cost me a bit more on a per day basis. Trip to USA from India is not at all cheap. Flight to US, local flights/travel, stay everything costs lots of money. A 20 Day USA trip from Cox and Kings or Thomas Cook costs 4.6 lakhs+ per person if going solo (doesn’t include everything, factor another 40k for optional extras, meals not included etc- 5 lakhs total). I am able to cut some cost due to cheaper India-US ticket, decision to stay in super cheap hostels/AirBnBs, usage of public transport and spending some of the nights with friends/family. Compared to these package tours, I am covering some 50% more for 40% less cost. May be it would have been wiser to stay at home and conserve this 3 lakh rupees-but then, the regret of missed opportunity will haunt forever. Let me fulfill this and tick off the box- not sure when I will visit this part of the world again. At times a Southwest flight could be lot cheaper than Grayhound bus. Do check both to decide. Early morning flights are cheap, but you’ve to spend more to stay close to airport or spend more on taxi to reach airport, as public transport is limited during night. So stay tuned as more detailed blog posts follow. Best wishes for the trip. Nice details and breadth of cities/countries. Feel it could be a lil hectic!But, am sure u can ace it!! Cool!! Have a fulfilling trip and enjoy !! Nice :) Big plan... enjai! Have a wonderful trip Shrinidhi. US has been on my radar for quite long as well. Maybe I'll keep this for my sabbatical too. Nice!! Have a great trip!! Great, Good luck for your trip.